How Republicans And Democrats Ended Up Living Apart : It's All Politics Democrats and Republicans are much less likely to live among each other than they were a generation ago. And new social-science research suggests that more Americans are motivated to move because they want to live among partisans of their own stripe. New research suggests that increasing numbers of people want to live among those who share their politics. 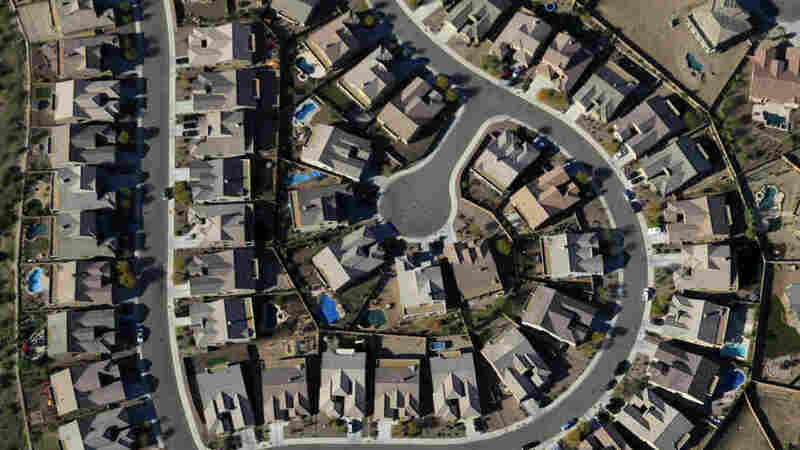 In this April 2010 photo, an aerial view of a Tucson, Ariz., housing development. These are politically segregated times. Secession movements are active in several states, generally consisting of residents of rural red counties seeking to separate themselves from the more liberal and urban-centered policies of blue-state leaders. And Democrats and Republicans are much less likely to live among each other than they were a generation ago. Back in 1976 — the year of a close presidential election — just over a quarter of the population lived in "landslide counties," where the winning margin was greater than 20 percentage points, says journalist Bill Bishop, author of The Big Sort: Why the Clustering of Like-Minded America Is Tearing Us Apart. Last year, more than half the country lived in landslide counties. And, while Barack Obama's margin of victory was less in 2012 than it was in 2008, the number of states decided by fewer than 5 points actually went down. States themselves have become more polarized, with most legislatures and governorships controlled entirely by one party. As a result, not only are blue and red states tracking different courses on just about every issue, but some people are seeking to escape their states. But if Americans are sorting themselves into like-minded communities, are they doing so on purpose? In other words, are people voting with their feet by consciously moving to states or counties that reflect their own partisan preferences? Researchers at the University of Virginia and the University of Southern California suggest that, yes, they may be. The recession and housing market declines of recent years have meant that Americans are moving a lot less than they used to. When they do move, demographers say, their main motivations remain traditional ones — housing and jobs. People then tend to end up living among people who are more or less like them, in terms of economic status, shopping preferences and the like. But the U.Va. and USC researchers, in a forthcoming paper in the Journal of Experiment Social Psychology, suggest that increasing numbers of people want to live among people who share their ideology as well. People are motivated to move away from communities where they don't fit in and try to find areas that are more congenial. Individuals have always sought to live among others they find congenial and similar to themselves, but, increasingly, that includes partisan leanings, Bishop says. "It is natural for people to desire communities where they share a worldview with their neighbors," writes the team, led by Matt Motyl, a doctoral candidate in psychology at U.Va. What's the evidence? Motyl and his colleagues draw from several different sets of data. First, they looked at surveys filled out by more than 1 million people at Project Implicit, a project run by researchers at several universities that examines social attitudes. Comparing which people had moved with the ZIP codes they were moving in and out of, they found strong indications that liberals and conservatives alike tended to move into more like-minded communities, based on local vote totals for Obama. They also looked at another survey data set and conducted their own experiments with undergraduates to explore how uncomfortable people felt if their beliefs didn't gibe with their communities, and whether that discomfort might motivate them to move. Both liberals and conservatives, they found, show a tendency to want to migrate to communities where they would fit in better. There's no evidence that people are moving in droves to live among their own partisan tribes, or that Democrats are selling houses at the first sign of a Republican moving into the neighborhood. "The desire to live near people of the same ideological group," the study authors concede, may be less important than jobs, safety and clean air, but they conclude it's "relevant" nonetheless. It remains to be found out how many people, if you asked them, would say that they had moved or wanted to move because of politics. Liberals threaten to move to Canada every four years if the Republican presidential candidate wins, but few actually make good on it. But other political scientists have noticed that Americans are tending to move into jurisdictions that share their worldviews and can become uncomfortable when they don't fit in. "The structure of a place cannot only shape political attitudes. It can also attract very different kinds of people," writes Torben Luetjen, a German political scientist who has been studying liberal and conservative enclaves in Wisconsin. "America has split into closed and radically separated enclaves that follow their own constructions of reality."